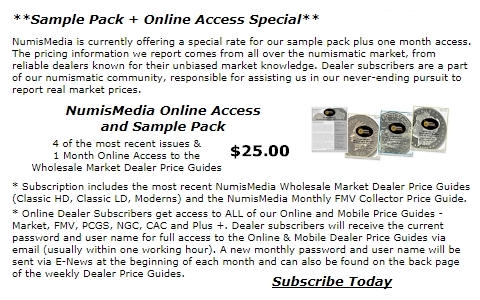 �����A variety of rarities have advanced over the last thirty days as reported in the NumisMedia 500. The common theme among these advancing true rarities is that buyers are looking for coins that are rare and have low populations for the specific grade and higher grades. �����For example, the 1897 S $5 Gold in MS66 is up to $10,250 Market in the last month, which is an increase of 16.15%. There are only four total coins certified in this grade by PCGS and NGC with just 6 coins grading higher. �����Another example is the extremely rare 1861 D $5 Gold in AU55 that has increased nearly 13% from $38,500 to $43,500. This coin has 15 certified in AU55 with another 15 in AU58. There are only 15 coins total in all Mint State grades with the highest being MS64. This date lists only 1,597 for original mintage. �����The following list shows some other coins advancing over the last month although some are not as rare as the two listed above. �����The metals are making a run to higher levels after a weak jobs report. While we have seen this in the past there are no guarantees the surge will continue. However, we are seeing some improvement in buying activity on the teletypes. More dealers are looking to buy bullion-related coins which usually means that their customers are requesting specific items. Gold is currently at $1,218.50 and Silver is $17.10. One ounce Proof Gold Eagles are trading at $1,378 in OGP and Proof Silver Eagles are up a little at $45.25. Bags of 90% Silver coins are currently $12,975 and circulated Silver Dollars are $24,725 for VG�s. �����There are a lot of changes in the bullion charts this week with all metals higher since the last Moderns Price Guide. The $50 Gold Eagle is up to $1,225 Market in MS69 and should be a little higher today with Gold on the rise. The $50 Gold Buffalo is at least $1,260 in PR69 and demand for this issue is very steady at current levels. Common date $5 Gold Commems have lost some of their luster as premiums have dwindled to the point that they now trade at the current melt value among dealers. This could present a good buying opportunity for these readily available issues.